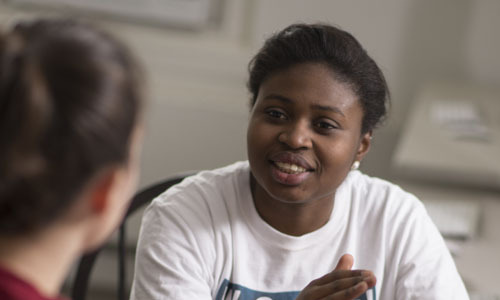 The WPI Office of Undergraduate Admissions invites African American, Latino, Native American, as well as students interested in diversity to apply for a special overnight visit. Discover: The Diversity Experience will allow you to meet current WPI students, staff, and faculty, stay a residence hall, enjoy the dining hall, and to experience all that WPI has to offer first-hand. We encourage you to apply! To be considered for the program, an application must be received by Friday, September 28 at 5 PM EDT. A limited number of travel scholarships are available to students who qualify. Please indicate travel scholarship interest on the application. For more information, contact the Admissions office at 508-831-5286 or discoverovernight@wpi.edu. Naomi's work in WPI's Quantitative Neurotechnology and Education Psychology labs gives her the problem-solving skills she'll need to excel as a surgeon. Alex's fun and packed schedule is a great example of embracing a healthy work-life balance at WPI.